Another Bad Dog Book by Joni B. Cole is definitely NOT another bad dog book. It is more a memoir or collection of thoughts, but trust me when I say it is one that you want to read. To be honest, it has little to do with dogs. Cole only briefly mentions her family pets (and her hatred for bad dog books). This may be a good thing since dog lovers and PETA members will not appreciate the front cover which boldly displays a dog smoking a cigar. This picture is a more accurate depiction of the book than the title. This book is above all else, hilarious. I would describe this book as being all the roll-on-the-floor-funny, embarrassing and just plain crazy stories that your female friends have told you compiled into one handy book. Except that these stories are well articulated by an imaginative and excellent writer and they have all the guilt, shame and modesty removed from them. As you read this book and hear Joni (yes, we are on first name bases now) bare her sole, you will come to cherish, adore and maybe even look up to Joni. There is a quote on the back of the book that states “Joni B. Cole makes you want to phone (not email) this new best girlfriend”. I completely agree with this statement. I had to restrain myself from contacting Joni and telling her stories about my life. Joni B. Cole is completely down to earth and relatable which adds a whole new dimension to the book. 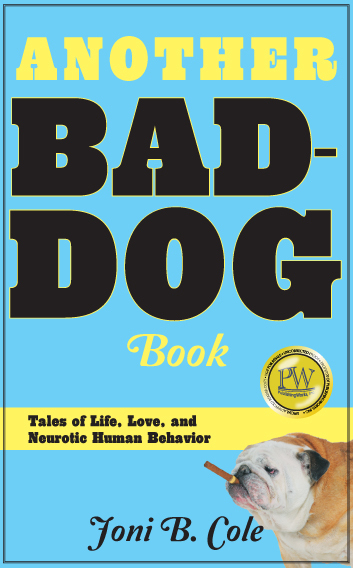 For a great read that will have you smiling, laughing and reminiscing about your own craziness, pick up a copy of Another Bad Dog Book. Article first published as Book Review: Another Bad Dog Book by Joni B. Cole on Blogcritics. This sounds great, going to have to check it out ! !